Spring Creek is another of the Northern Ozarks babbling brooks, very similar to Blue Spring Creek, Little Piney Creek, and Mill Creek. It is fed by smaller springs, and the water quality and flow are very dependent upon periodic rainfall to recharge the spring. This stream is lovely and qualifies as the type of destination that you might seek out first for the solitude, second for the trout. The trout management area begins at Relfe Spring and stretches to the Big Piney River -- a little more than six miles. The upstream half of the creek is on private property, and they do not allow access, so watch for the private property signs. You'll have to do some wading, but you'll find fish almost every place the stream narrows into riffles and drops into a little pool. You'll need to adjust the general locations you fish, dependent upon seasonal migration. The only other rule of thumb is smaller nymphs (#14-18) and larger dries (#12-14), but that's not written in concrete. The fish are opportunistic feeders, and your success depends on your approach and your presentation much more so than your fly. After a good rain, the water will come up a bit and become just a bit murky. This water quality can actually help you. With decreased visibility, the fish become more aggressive feeders and a clunky approach and poor presentation are more readily forgiven. In the heat of the summer when the water is low and warm, you need to seriously on your game to get hookups, concentrating on deep riffles and deeper pools, careful approaches, delicate casts from a good distance away, and controlling your line properly. It's not too difficult to get here. If you're stationed at Fort Leonard Wood, the creek is basically across the street from the East entrance to post. From Eastgate Road, turn left on Highway J and right on the dirt road (CR 6410) to ride alongside the creek, or cross the bridge for a Department of Conservation access on your right. If you're like most, however, you'll take I-44 toward the Fort Leonard Wood area (half-way between Rolla and Lebanon). Take exit #169 and head south on Highway J. In about 8 miles, you'll see a little convenience store on your left at the intersection with Highway M. You'll cross the bridge over the creek in short order, and your access roads will both be on your left, before and after the bridge. If you take CR 6410 (west of the bridge), you'll find "Spring Hollow" on your left via USFS Road 1738. From the point where that road crosses the creek, you have about 1000 feet of public access to the upstream side before you'll have to turn around, but you can fish all the way downstream to the Big Piney -- certainly enough water for a full day of fishing. The regulations give permission to harvest 1 fish 18" or longer, but that's really uncommon. 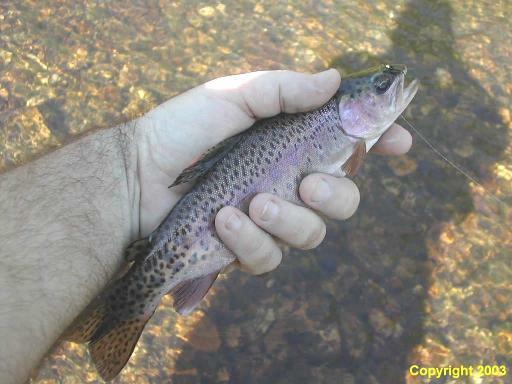 You'll generally catch fish in the 4-11" range with the occasional 14-incher thrown in to add some excitement. Even so, catching a 14-inch fish here deserves as much admiration as catching a true trophy on big waters.